Celtics fall to Cavaliers in game 4, 111-102. Series is tied 2-2. The Boston Celtics took a tough L in Ohio in Game 4 of the Eastern Conference Finals, falling to the Cleveland Cavaliers 111-102. They went down early, forfeiting a double-digit lead in the game's first quarter, and while they came close to coming back like they had oh so many times during the regular season, tonight they couldn't make it happen. The Cavs have evened up the series 2-2. The Celtics were brutalized in the first quarter, plain and simple. They were out-rebounded 17-8, they shot inaccurately, hitting just 26.9% of their takes and missing wide-open shots from all over the floor, including multiple clear-lane slam dunks. 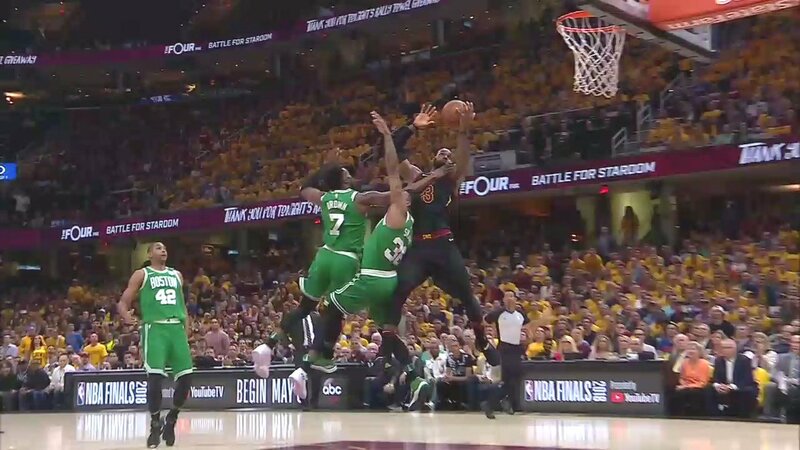 In the middle of the quarter, the Cavs went on a 10-0 run, which was ended by the Celtics' only three-pointer of the first quarter from Semi Ojeleye. They went 1-7 from deep in the first twelve minutes. A sure factor of the poor play was Marcus Smart. He shot 0% from the floor after missing all four of his attempts, three of which were from long range. They were bad shots, too. It was classic Marcus jacking when he didn't have to. His other miss in the quarter was a terrible look under the hoop with Tristian Thompson towering over him. As expected by everyone watching, Thompson blocked the ball. He ended the quarter with one point after going 1-for-2 from the line. The Cavs looked much better than the Cs. Their defense was prevalent from the game's first play, and it continued through the quarter. After one, they had 3 blocks. They also had their best scoring quarter of the playoffs thus far, dropping 34 big ones. Everyone scored a little bit, but LeBron James led the way by scoring 11 points on perfect 4-of-4 shooting. Here's LeBron LeBron-ing off of a perfect pass from Kevin Love. The Celtics were down after the first 34-18. The second quarter didn't go much better. It began with Jaylen Brown carrying over the first quarter's frustration into the second. He was clearly over aggressive and consistently forced up his shot. He ended the quarter with 8 points on 3-of-8 shooting. The Cavs continued to shut down Al Horford, who had a tough time getting off a shot in the first half. He finished with 7 points on 2-of-6 shooting. The lone stud in the half was Terry Rozier, who did a little bit of everything in the second quarter. He finished with 10 points, 5 rebounds, and 7 assists. Terry kept the Celtics in the game during the second quarter. Without him, the hole would've been much greater. The Cavs continued to hit during the second quarter. LeBron had his second consecutive 11 point quarter, a lot of which points came from switches onto Rozier. Kyle Korver got hot, hitting all of his shots and finishing the half with 14 points. Tristian Thompson stayed aggressive and had 10 in the first. The Celtics did have a good run in the quarter, where they brought the game to within nine points, but at the end of the half, they were back to down 15 points. The score at the half: 68-53 Cavs. Celtics get it down to 10. Offense has been stellar this quarter. 25 points in just eight minutes, pretty much all great looks. To put the half into perspective, 68 points allowed ties the most that the Celtics have given up in a half all season. But, the Cs did drop 35 points in the quarter. Something to build off of heading into the third. The start of the third was encouraging. Al Horford started the scoring with a mid-range jumper, his third field goal of the game. Then Jaylen took it to the rack twice for easy buckets. And the team defended well, proof of which can be seen here with the tremendous effort from Terry. Just as the Celtics were gaining ground on the Cavs, controversy struck. Marcus Morris hit a three-pointer, but it was called an offensive foul. The referee said that Mook kicked out his leg on the shot. Horrific call. The game got a bit whistle-y in the third quarter. These refs needs to decide if they want to call touch fouls or let guys play. They are trying to play it both ways and it is ruining the game. The Celtics brought the game to within eight points in the third, but when it was all said and done, the Cavs kept their lead at 13. The score: 89-76. Each of the five Celtics' starters headed into the fourth with double-digit points. Jayson Tatum was the story of the third. He finished the third with a team high 17 points. LeBron scored 13 in the quarter, making his game total at the time 35 points. The Cavs shot 54.2% from the field through the game's first three quarters. The fourth began with LeBron on the bench and the Celtics took advantage. Jaylen came out strong. In the fourth's first three minutes, he had already tallied 7 points, including an and-one in the paint. Then, Big Money Al Horford broke the double team with this spin move and slam, bringing the game to within 8 again. The Celtics trimmed the lead down to six at their best, but squandered it away again and lost Game 4 111-102. We'll be back in Boston on Wednesday for Game 5.